Flying in and out of cities can be exhausting, and there’s nothing worse than getting in a dingy vehicle when you were expecting a luxurious corporate transportation provider. Thankfully, if you’re doing business in South Florida, we have you covered. At M&M Limo & Airport Service, we offer luxury limousines, sedans, SUVs, buses, and more. We offer affordable prices, without sacrificing quality and customer service in the process. We understand that business to a businessman and businesswoman is no joke, and therefore, we certainly don’t take our responsibility lightly. Our prompt and courteous chauffeurs can help assist you in whatever you need, while making sure that you get to where you’re going safely and right on time. We know that our business travelers and regulars have tight schedules, and we respect the necessities that many executives require. For example, getting into a vehicle that isn’t high quality can be distracting for any passenger. With our clean, supreme, and spacious luxurious vehicles, we give our clients the eloquent surroundings to spread out and get things done, or simply relax after a busy day. At M&M Limo & Airport Service, we also offer rides to and from the airport, whether it’s Fort Lauderdale / Hollywood Airport or Miami International Airport, we can get you to your flight safely and efficiently. There are many reasons why hiring a luxury car service for your executive team can be beneficial. Driving a rental car or parking your own car can be stressful, especially when it comes to the return process, expensive parking, airport traffic, and pricey payments. Our professional drivers can pick you up, drop you off, and make sure that you have time to spare in the process. At M&M Limo & Airport Service, we’ve been in business for over 25 years, leaving us as the number one location for corporate transportation in Boca Raton. When arriving to an important meeting, what type of vehicle you exit from says a lot about your businesses quality, at least to an outsider’s perspective. Travel in style and comfort, and call our extraordinary team to schedule your corporate transportation today. Why Choose Hourly Car Services in Palm Beach County? Whether it’s snowbird season or the middle of summer, it seems that Palm Beach County roadways are always packed. At M&M Limo & Airport Service Inc, we know that you have many different options when it comes to beating the traffic these days. Nothing is more luxurious than our hourly car services in Palm Beach County. If you’re looking for the utmost professionalism, true timeliness and ease of booking, there’s no choice better than M&M Limo & Airport Service Inc. We’re committed to getting you to your destination on time, in style and with the utmost care. Don’t trust just any car service, it’s time to discover the M&M Limo & Airport Service Inc difference. For our drivers and customer service coordinators at M&M Limo & Airport Service Inc, car service is about more than just driving you from Point A to Point B. Car service is focused on ease of travel and luxury. We know that when it comes to booking hourly car services in Palm Beach County, you need it done quickly and the right way. We offer a full fleet of top of the line cars with truly professional divers. Our drivers are always safe, courteous and reliable for each and every client. We can assist with the best airport transportation, corporate travel, sporting event transportation and car service for a memorable night on the town. When you chose our team at M&M Limo & Airport Service Inc for your transportation needs, you’re choosing the best transportation solutions. We are committed to consistently providing transportation solutions that embody luxury. Whether you’re choosing our hourly car service, our wedding limo services in Palm Beach County, our fleet services or anything in between, you’re sure to be impressed with our professionalism and comfortable vehicles. If you’re transporting a large group, it’s time to see how our services can help. Our hourly cars are perfect for getting the family to and from destinations such as the airport, special events and any parties. We also suggest looking into our party bus service in Palm Beach County for larger groups such as bachelorette parties, sweet 16 parties or anniversary celebrations as well. When you’re looking for hourly car services in Palm Beach County, we hope you’ll count on our professional services at M&M Limo & Airport Service Inc. We’re committed to offering our clients the utmost professionalism when it comes to reliable transportation. Don’t overpay, don’t deal with complicated phone apps and don’t rest all of your transportation needs on the shoulders of unqualified and unsafe drivers. Discover the safety, reliability and luxury of M&M Limo & Airport Service Inc for your transportation needs. No matter what the time, we’re here to give you a ride. Call (561) 488-6014 to reserve your car. Posted in Airport Transportation, Alaska Air, Boca Raton, Car Service, Driver, DUI, Fort Lauderdale-Hollywood International Airport, Hourly Car Service, News | Comments Off on Why Choose Hourly Car Services in Palm Beach County? Why Choose Limousine Service in Boca Raton? When most people think of limousines, they think of the ultimate luxury. While limos do still represent the best in luxury and comfort, there’s no reason you can’t enjoy limousine service in Boca Raton for yourself! You may think that you have no special events coming up, but at M&M Limo & Airport Service Inc, we think that there are special events each and every day! Whether you’re heading to the airport, out for dinner or off to a wedding, you deserve the best in transportation. Why not enjoy a little luxury with an affordable limousine in Boca Raton? 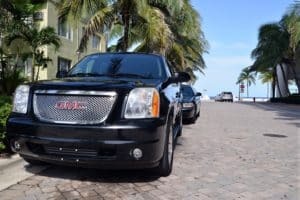 At M&M Limo & Airport Service Inc, our limousine service in Boca Raton is waiting for your call! When it comes to limousine service in Boca Raton, you don’t need a fancy excuse to kick back and relax. With our services, you can turn a trip to the airport into a memorable one. With a limousine in Boca Raton, you can comfortably fit your entire family in one vehicle as you ride to the airport together. Chances are, the ride in a Boca Raton limousine may even be your kid’s favorite part of the trip! Of course, limousine service in Boca Raton is about more than just airport transportation. Whether you’re heading out to prom, a wedding, a night on the town or any other celebration, you deserve a luxurious ride. At M&M Limo & Airport Service Inc, we know that any event, outing or celebration will only be enhanced by a limousine in Boca Raton. Plus, there’s no bachelor or bachelorette party that’s complete without a limousine! Our limousine service in Boca Raton is perfect for a night on the town. With one of our professional chauffeurs at the wheel, you won’t have to worry about the hassle of finding a designated driver. That’s because we’re here to drive you out and about. You can focus on enjoying the evening when you count on our limousine service in Boca Raton. We can include luxury features such as champagne and even sodas for the kids in our limousines. If you’re planning a special event or if you’re looking for timely transportation, it’s time to consider reserving your very own limousine in Boca Raton. At M&M Limo & Airport Service Inc, we offer the very best limousine service in Boca Raton. We’re here to help you arrive in style and luxury. Whether you’re going out for a night on the town or you’re looking for corporate transportation, you can count on our limousine service. You can get your free quote by clicking here. Posted in Airport Transportation, Boca Raton, Car Service, Driver, DUI, Limo, Limo Service, Limousine, News, Palm Beach International Airport, Past Events, Ride, South Florida Events, Transportation, Travel | Comments Off on Why Choose Limousine Service in Boca Raton? Posted in Boca Raton, Car Service, Driver, DUI, Limo, Limousine, News, South Florida Events, Sporting Events, Travel | Comments Off on Trust a Car Service in Boca Raton and Avoid a DUI On Your Night Out! You’ve worked hard all week at the office and now it’s time to enjoy the weekend. Most people in South Florida would love to treat themselves to a night out on the town. From West Palm Beach to Fort Lauderdale and all the way down to Miami, there are plenty of things to do and places to see. But too often, people choose to stay home because they don’t want the hassle of finding a designated driver, dealing with South Florida traffic or driving for miles just to find that elusive parking space. But when you choose M & M Limo & Airport Service, all of those headaches are eliminated. When you’re going out with a group of friends, the last thing you want to worry about is how everyone is going to get home safely. Everyone should drink responsibly when enjoying a night out, but sometimes it can be difficult to determine how much is enough. Partying safe is the best way to have a good time. A limousine service can ensure you and your friends will arrive at your destination on time and can leave with complete peace of mind. M & M’s chauffeurs are highly dependable and can accommodate any of your special requests. There are a wide variety of benefits by choosing a limousine service. It’s a great way to impress your friends or business associates with luxurious comfort and a great sense of style. With M & M’s fleet of elegant limousines, you can bring as many guests as you’d like. M & M Limo in Boca Raton, FL can organize your evening destination plans based on your request to make your night on the town the perfect evening experience. If you’re going to a concert or want to enjoy a play at the theater, driving can be hassle. Even if you have GPS in your car, dealing with South Florida traffic can be a pain. But when you choose M &M Limo & Airport Service, you can arrive at the venue on time feeling like a rock star. It makes your experience better and you can enjoy the show without having to clamor around for a parking space. Just as there are so many different places to see in South Florida, there are also plenty of things to do. A limo service is also perfect for bachelor parties, birthdays, anniversaries, Bar/Bat Mitzvahs as well as graduations. What truly makes an evening special is creating a memorable experience. You don’t have to be a rock star or a celebrity to enjoy the comforts and luxury of a limo service. But there are few things better than feeling like a VIP. Conveniently located in Boca Raton, M & M Limo & Airport Service can provide your transportation needs from anywhere in South Florida. Call us today at (561) 488-6014.